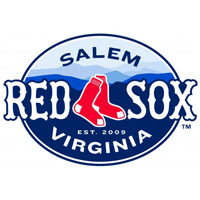 Kevin Heller singled in Reed Gragnani with the bases loaded in the bottom of the tenth inning to give the Salem Red Sox a 4-3 victory over the Carolina Mudcats at LewisGale Field Thursday night. The Sox loaded the bases in the ninth with no outs off Mudcats reliever Rob Nixon with a walk, single and hit by pitch before Heller drove in the winning run. Madison Younginer got credit for the victory, throwing two perfect innings out of the Sox bullpen. Younginer and Jonathan Aro war perhaps the MVPs of this game, keeping the Mudcats off the board from the fourth inning on to give the Sox a chance at the victory. Aro threw four and two innings in his Salem Sox debut, allowing just two hits and striking out six Mudcats. Cody Kukuk got a no decision for Salem, going three and a third, allowing two hits and three runs. Kukuk walked six and struck out five. The Sox opened the scoring in the first off Carolina starter Ryan Merritt. Matty Johnson led off with a walk and moved to second on a wild pitch. After getting two outs, Merritt surrendered a walk to Carson Blair to put runners on the corners with two outs. Reed Gragnani and Mario Martinez singled back to back, each driving in a run to give the Sox a 2-0 lead after the first. Carolina answered in the third. Kukuk walked Todd Hankins with one out, who reached second on a wild pitch. Yhoxian Medina singled in Hankins to cut the lead in half. Then after a walk to Joe Sever, Yandy Diaz singled home Medina to tie the score at two. In the fourth, LeVon Washington walked with one out followed by a walk to James Roberts. Kukuk was relieved by Aro, who surrendered a double to Luigi Rodriguez to give the Mudcats a 3-2 lead. From that point forward, Carolina would manage just one hit and go scoreless the rest of the game. In the sixth, Reed Gragnani walked off Merritt, who then gave way to Josh Martin. After picking up a fly out and a strikeout, Kevin Heller singled in Gragnani, who had reached second on a passed ball, to tie the score at three. The game remained a 3-3 tie until the tenth. Salem left five on base between the sixth and tenth to keep the game tied before Heller ended it in the tenth. The Sox now stand 3.5 games behind Carolina for the second half playoff spot. Salem hits the road tomorrow to take on Myrtle Beach. First pitch from the Grand Strand is at 7:05. Salem’s starter is still TBA.